Identity/Class: Normal human, technology user. Affiliations: Unnamed alien race who gave him his belt. Powers/Abilities: Flight, super-strength. All powers stem from the extraterrestrial designed belt he wears. The belt is equipped with a security device which prevented anyone other than Supervolador from using it; the security device caused an explosion which would kill any unauthorised person who attempted to use the belt. History: There exists a race of extraterrestrials who protect the order of the universe. In order to carry out this principle on Earth, they picked Jet Carson, one of three triplets, and gave him a belt which granted him superhuman powers. He became the superhero Supervolador, and although it soon became well known that he was connected to the triplets, which one was Supervolador remained a secret from the public. "Supervoledor did not always intercede against apparent menaces, and once let an invasion of Earth by a dying race of extraterrestrials take its natural course. 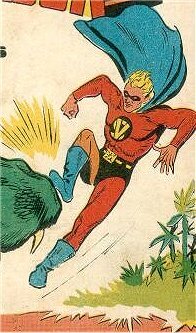 Supervoledor was the lead feature in an anthology comic, which also featured Fly Man and Graviman, and was published during the 1960s. The series was written by S.O. Almendro and the artwork was by D. Mangrasotti. Apparently, the three identical brothers would often be contacted for help in unusual cases and, by and by, Supervoledor would appear and put an end to whatever the menace might be. The extraterrestrials who furnished the belt sound more than a little like the Guardians of the Universe from the American silver age stories featuring Green Lantern; the extraterrestrials were obviously prudent in equipping the power-belt with a safety device to prevent it being abused, and more than one villain died badly when he attempted to use the belt for nefarious purposes."